What does one do after a wonderful weekend of hanging out with fellow oenophiles, drinking wine, and talking about blogging? Drink more wine, of course! If you'll allow me a moment of mushiness, I am so grateful to have this hobby. It's allowed me to see parts of the country I never would have and to meet so many cool and interesting people! Okay, mushiness over. Back to the wine. 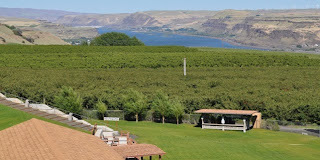 Hubby and I had driven through the Columbia Gorge before, but we hadn't ever tasted the wine through there. The Columbia Gorge Wine Growers website bills the area as "A World of Wine in 40 Miles!" Part of the area is The Dalles, which, if you ever played the video game Oregon Trail, might briefly make the words "You have died of dysentery" flash through your mind. Luckily there's just wine now. 2006 Reserve Merlot: I noted that this one is pretty. Tobacco-berry-cassis with a long, smooth finish. 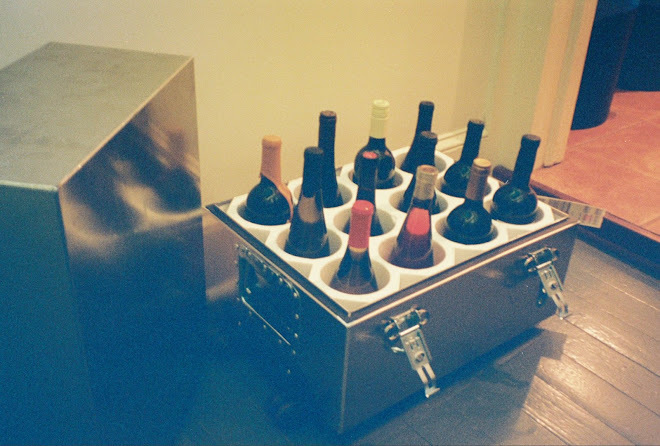 Since our mission was to stock up on whites, we came away with a bottle of the Viognier. Cascade Cliffs 2009 Estate Symphony: The grape is a cross between Muscat and Grenache Gris (not to be confused with the Bovin Symphony wine, which is a blend -- sorry for the confusion). Flavors of stone fruit and a little citrus. 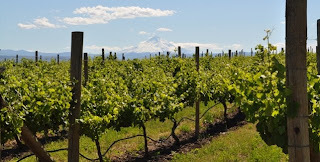 I also learned a valuable lesson about Washington and Oregon wine geography. When tasting room staff says that the fruit came from "the Valley," they mean the one that they're in. I got a little confused since there's a bunch of them, and they all seem to produce good grapes. This one was noted to be "grapes gone wild" with nice dark berry and raspberry flavors. A little hot, it should mellow. Owner and winemaker Pat Graham entertained us in the tasting room. That's what I love about small wineries -- getting to know the people. We bought one of the whites, the Chardonnay. Yes, a Chard I liked! This winery will be one to watch. Stunning pic of Mt. Hood. The landscape is just so different out there. Our Bovin Symphony is n equal 33% blend of Riesling Sauvignon blanc, and Chardonnay. 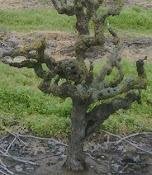 The symphony grape is a varietal created at UC DAvis Muscato of Alexandria and Grenache gris. It is a much sweeter wine than our "Symphony"
Thanks, Joe and Hudson, for your question and clarification! I've corrected the text in the post. I should've asked Hudson before posting.